As any Mexican school child can tell you, Dia de la Independencia tells the moving story about how Father Miguel Hidalgo y Costilla helped lead the fight to end 300 years of brutal class prejudice. His speech to the people of Mexico on September 16, 1810 marked the beginning of the decade-long fight for independence from Spain that finally resulted in victory for Mexico in 1821. This year, mark your calendars for Monday, September 16, 2019 when Mexican Independance will be celebrated with fireworks, fiestas, and crowds roaring "Viva Mexico! "Viva Mexico!" Mexico's celebration of independence is officially marked on September 16th, but the festivities usually begin the night before, on September 15th. 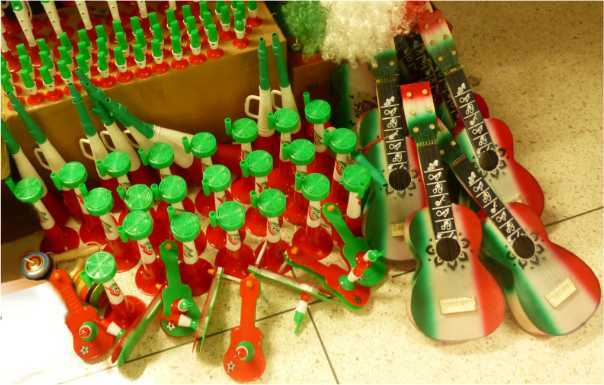 On Independence Eve, cries of "Viva Mexico!" can be heard shouted in town squares from Tijuana to Cancun as the skies are illuminated with spectacular fireworks displays in neighborhoods from coast to coast. And, everywhere, the official colors of the day are red, white, and green - echoing the colors of the Mexican flag -- to express the patriotism people feel on this day. in preparation for Independence Day on September 16. The following afternoon, on September 16, the grandest of all parades takes place in Mexico City and other major towns and cities when schools and most businesses close for the day so everyone can take part in the holiday festivities. While Cinco de Mayo has come to define all Mexican celebrations in the US, it is on Mexican Independence Day when citizens (and Mexican communities worldwide) exhibit their swelling pride with dancing, music, local parades, and family fiestas. Throw a Fiesta for Mexican Independence Day - Feature article from NBC with party tips and lots of recipes. El Grito de Independencia - Inside Mexico gives a brief version of the history of Independence Day and then takes you on a virtual tour to experience the celebration repeated every year in every village and city of Mexico to mark September 16th. El Grito de Dolores - A balanced version of the story of Padre Miguel Hidalgo y Costilla and the events of September 16th, 1810 give a realistic, but still patriotic overview of the forces that brought about Independence from Spain. Mexican Independence - Mexican Independence with a Texas twang...on this site of the sons of DeWitt Colony Texas. Most Americans don't realize that when Mexico fought for freedom from Spain, Texas was part of Mexico! Mexican Independence Day E-cards - Send a greeting card to celebrate Mexican Independence Day with a nice selection of cards to celebrate freedom.